Of all the directors currently working, there are few who use locations more eloquently than Matteo Garrone. His latest film – and arguably his best – unfolds under mottled, corpse-flesh skies in a sprawl of cancerous concrete along a blighted seafront just north of Naples. Also used in Garrone’s breakthrough picture Gomorrah it’s a location with a history. A semi-derelict resort known locally as the parco degli abusivi, or “Park of the Illegals”, it was developed in a haze of 1960s optimism but corrupted from the foundations up by organised crime. 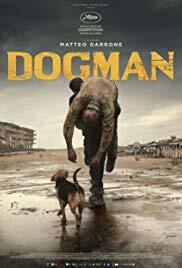 The perfect backdrop, then, to this tale of Marcello, a meek little dog groomer who aspires to a decent life but finds his world tainted by the targeting of bullying lowlife Simone. Fonte, who deservedly won the best actor prize at Cannes last year, is remarkable. He is in many ways a tragic figure, with his mournful, trusting eyes and a smile that is the craven, appeasing grimace of a kicked animal. Admittedly, the whole dog/man symbolism is a little on the nose at times. Simone clenches his big hammy fist and cuffs him, an outward display of affection that is designed to hurt just enough to keep Marcello in line. There are a few things that Marcello holds dear. His relationship with his daughter from a failed marriage. The dogs he cares for. And his standing within the community of fellow business owners in the gap-toothed strip of shopfronts. One by one, Simone threatens or destroys them. Finally, having served a prison sentence for a crime that Simone committed, Marcello decides that he has had enough and attempts to strike back against his tormentor. It was never going to be an even fight. If Marcello is a nervy terrier of a man, Simone is a battle-scarred mastiff. A wrenching final shot, in which realisation settles on Marcello’s face as he slumps in a desolate children’s playground, is given an added potency by the knowledge that this sad, savage tale is based on a true story.